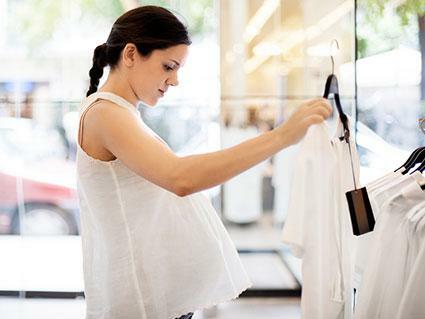 When you're shopping for maternity apparel, you want something that fits well now and in the future. Choose items that will grow with you rather than trying to purchase clothing too far in advance since you won't be able to predict exactly how your body will change. If you have the opportunity, try on the clothes before making a purchase. Do a quick internet search of the item and read the reviews from store to store to see if you should adjust your sizing. Many online retailers have customer feedback about whether an item is true to size, runs small, or runs large, etc. Every woman's pregnancy is different, and lots of factors play into where, when, and how quickly weight gain occurs. If you have to go up a size, don't worry about it. You're beautiful no matter what, mama! You'll be back to your normal size in no time. Try to mimic the style and fit you liked before your became pregnant. While you may have to make some adjustments to the fit as your baby grows, looking at the fit of the jeans in your pre-pregnancy closet is a good starting point. If you like to wear your pants down low, you're not going to be a fan of a full band over your belly to keep your pants up high. Look for bottoms that go under the belly in the front but provide coverage in the back. You may also like demi panels, which will comfortably keep you in that low-rise jeans feeling you're used to. If you like to wear high-waisted pants now and are carrying low, a lower waistband in the front may prove to be the most comfortable. A lower waistband in front will also mean your backside stays covered as your belly grows over the top, so long as you're shopping in the maternity section and not just trying to go up a size or two in the clothes you usually wear. You may even be able to wear these maternity bottoms post-pregnancy if you take the style into account and find items that don't have the telltale panel in the front that screams, "I'm pregnant!" During at least the first few months of pregnancy (and sometimes even beyond), you can often get away with wearing what you have despite a growing belly. Consider the following for wearing your non-maternity bottoms. You can extend your jeans and other bottoms with a button at the waist. Leave it unbuttoned and then slip a product like The Belly Button™ Band over the waistband of your pants. This will hide the button and look like an extra layer under your shirt (helpful when your belly grows and your shirts begin to creep up, too). In the early months, you may be able to get away with wearing your dresses and tops with empire waists. Don't be tempted to buy more of the same in a larger size from the section of the store from which you usually shop. Do go for empire waists to accentuate your growing bump, but get them from the maternity section, or you'll have too much material everywhere but the belly area, which isn't the most flattering. With the maternity options, you'll get the extra material in just the right areas without sacrificing fit elsewhere. If you're not interested in shopping for jeans every few weeks, knowing you'll just be throwing them into a donation pile or the back of a closet in a few more months anyway, look for panels that will grow with you. Full and side panels are usually the most versatile from month to month, and they tend to be most flattering and comfortable overall. Just be aware the panels tend to come in a shade that matches the pants, not your skin, so wearing a light-colored top may allow a full panel to show through in the front. Whether it's on a top or a dress, ruching will allow you to get more wear out of your maternity clothes. The ruching is flattering to your figure, but it also allows for some growing room because it stretches. Since you won't be wearing them (at least not for long) after the baby comes, getting the most out of just a few pieces is key to surviving pregnancy without going broke for the sake of a temporary wardrobe. Beyond ruching, look for tops and dresses with extra room in the torso because they won't ride up and expose your midsection (as cute as a baby bump is!) as you grow. Shirts with elastic waistbands will also provide a comfortable fit because the tops are less likely to ride up. You're probably going to want a few items in your wardrobe that you know you'll never wear again just because they're cute, event-specific, or too practical at the time to pass up. However, thinking beyond the pregnancy to the weeks or months after the baby is born will be beneficial to your wardrobe, your wallet, your comfort, and in some cases, even your emotional state since it can be frustrating to have a wardrobe of too-small clothes you're waiting to get into, as well as a heap of maternity clothing that no longer fits just right, either. You won't be wearing all of your maternity clothes after the baby's born, but there will be a period when you'll want the comfort of slightly baggy jeans and a top that doesn't accentuate your midsection. Look for loose-fitting items like boyfriend style jeans and oversized sweaters to extend the life of your maternity wardrobe. During your pregnancy, those baggy jeans and oversized tops can be comfortable for your thighs and upper arms if you're retaining water in those places. Once the baby's born, they'll have a trendy, loose fit that will look and feel great. Who doesn't love stretchy pants? During pregnancy, a little stretch is especially important but be sure not to go too extreme. Pants and shorts with a lot of stretch, specifically, can lose their shape over the course of the day. Instead of comfortable bottoms that hug all your new curves, you could end up with saggy pants or shorts you feel like you need to keep pulling up or readjusting. Taking measurements for online ordering is easier than you might think! You may not actually have to measure anything at all if you already knew your measurements before pregnancy. They're all going to be the same, even though you're growing. For example, a size 8 or waist size 28 -- whichever measurement you used to shop for your pants before pregnancy -- will still be a size 8 or 28 in the maternity clothing world, even though they have enough extra room for the average 25-35 lb weight gain. They like to keep things as simple as possible for moms-to-be. If you do need to get actual numbers because you aren't sure what measurements you started with, measure the same way you always have. For tops, you'll want to wear a bra that has no padding and measure around the fullest part of the bust. For bottoms, measure around the fullest part of the hips with your legs together. You'll skip the waist measurements in maternity sizing. Once you have the numbers, simply compare your findings to the store's sizing chart. From ruching to stretchy panels, the key to finding a good fit is to look for items with length and a bit of stretch (but not too much). In many cases, you'll be able to enjoy your maternity wear postpartum, which will take some of the stress out of getting dressed as your body returns to normal.